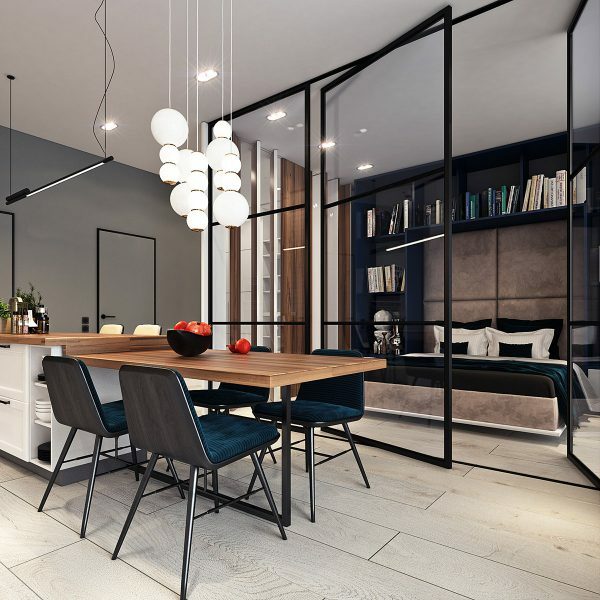 These cozy apartments may be small, but they emanate big style with their elegant finishes and multipurpose layouts. 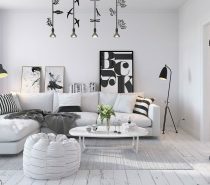 All white may work to highlight and expand some smaller spaces, but these humble abodes take small living in a different direction. They are bold, brilliant, and blue. That’s right, blue! Each one is filled with a mix of contrast and color that helps showcase their brilliant design. Would you downsize your life to fit in one of these stunning, multi functional homes? 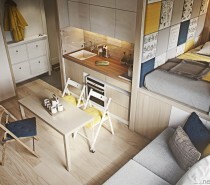 We never thought that you could find everything you need in a 50 sq. 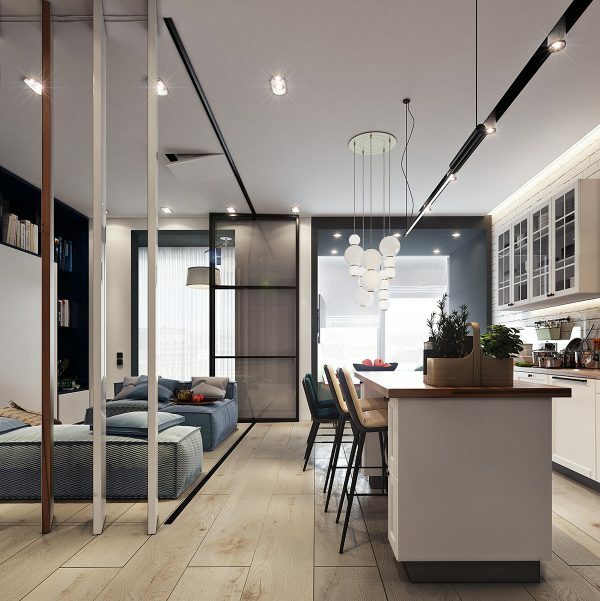 meter apartment, but these blue beauties have us thinking twice! 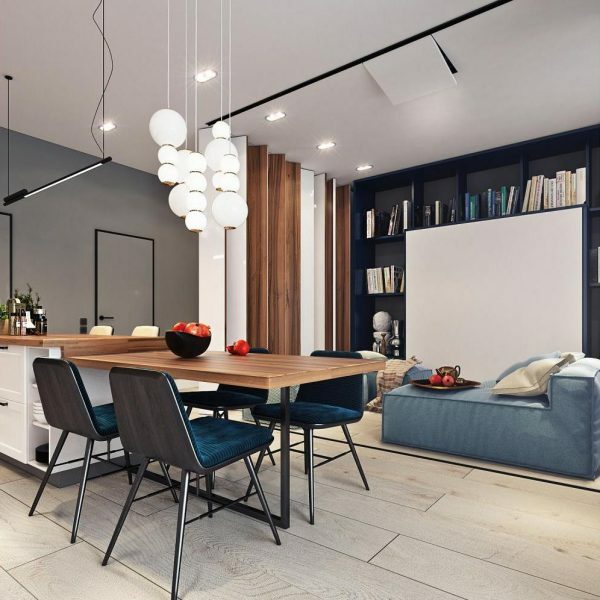 This elegantly executed apartment was created for a young woman as a multi functional space. 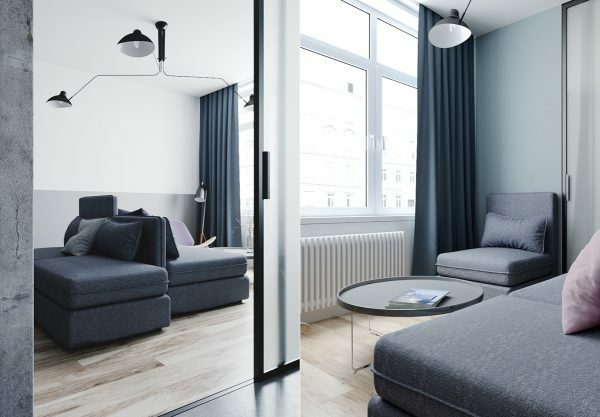 From a bedroom that transforms in to a living room to a bed that doubles as a projector screen, no space has been wasted in this modern, mini design. And certainly no style has been sacrificed either. 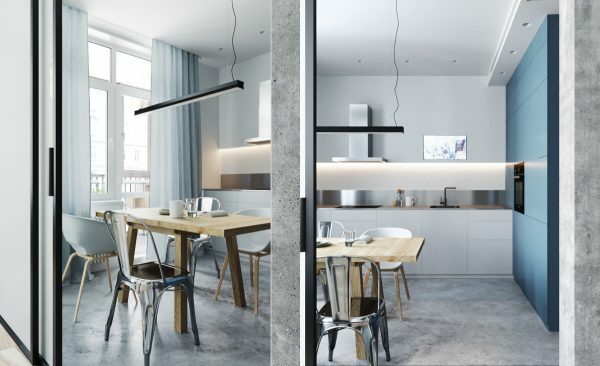 Whether it’s dinner for one or a party for ten, this apartment has it covered! 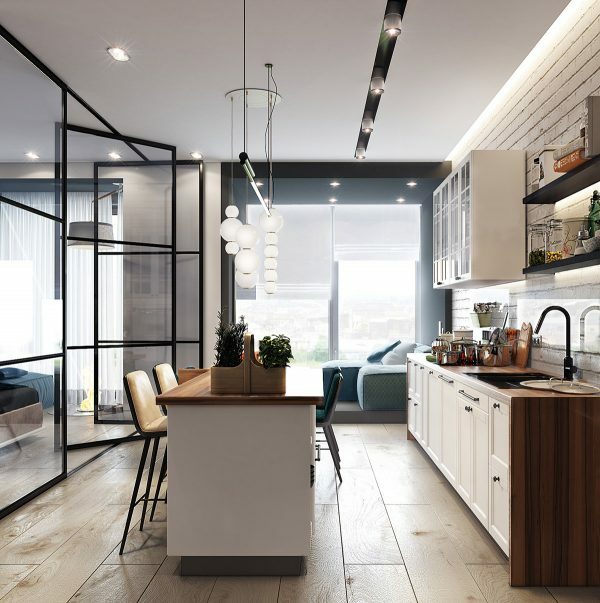 The modern vibe of this small, open-concept design has us in awe. A projector screen that we can see right from the kitchen table? Yes, please! Not to mention that when you’re done, that same screen folds down to create a cozy bed. Just see for yourself in the next photo. Slide out, glass panels are an ingenious addition to this home’s design. 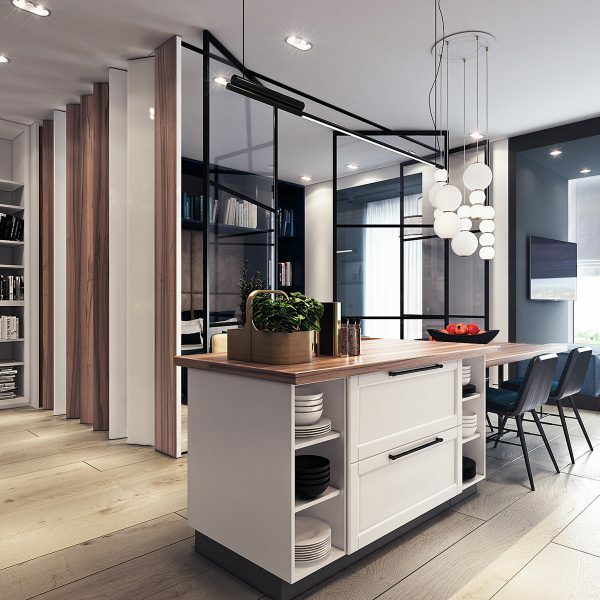 They’re a great way to impart a little separation between the kitchen and bedroom, all while maintaining that open-concept feel. From contemporary living room to cozy bedroom. 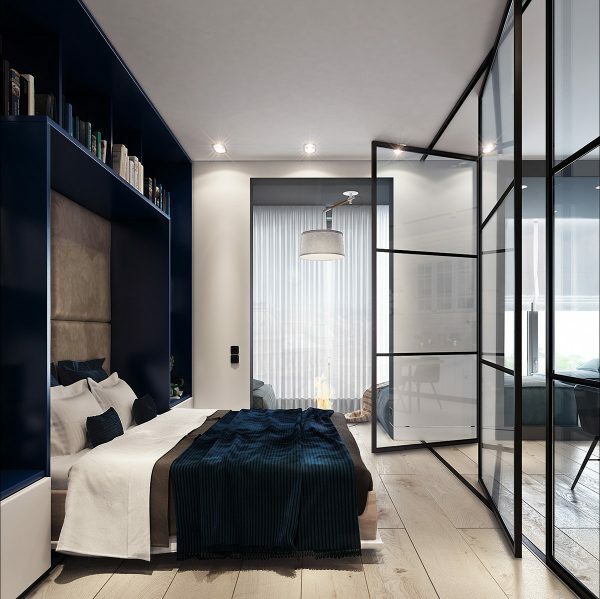 This fold down Murphy bed is one to envy with its built-in shelf surroundings and luxurious, navy blue linens. 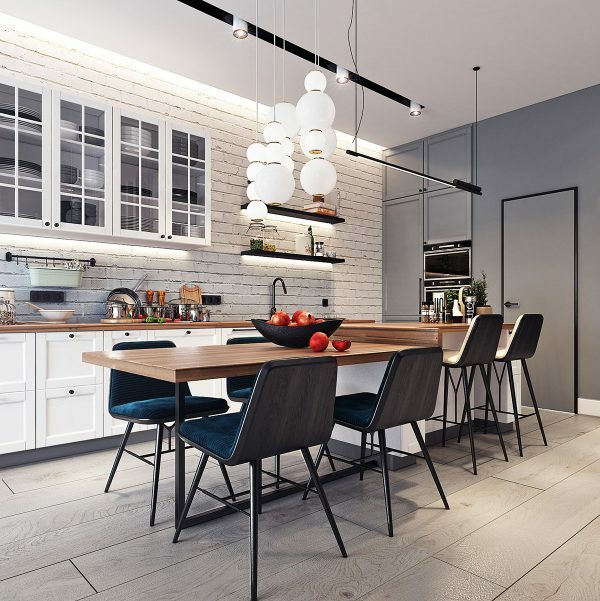 Pot lights, under cabinet lighting, globe pendant lights, and a large window make sure there is no lack of light here. The small blue living room off to the side looks like the perfect place for a cup of tea and a good book. It is the epitome of cozy, if we’ve ever seen one! The light wooden countertops and white brick backsplash are the perfect contrast against the navy blue chairs in this eat-in kitchen. Little touches like the bold fruit bowl also don’t go unnoticed in this setup and really help harmonize the space. A great view of all the natural lighting and the waterfall countertop. 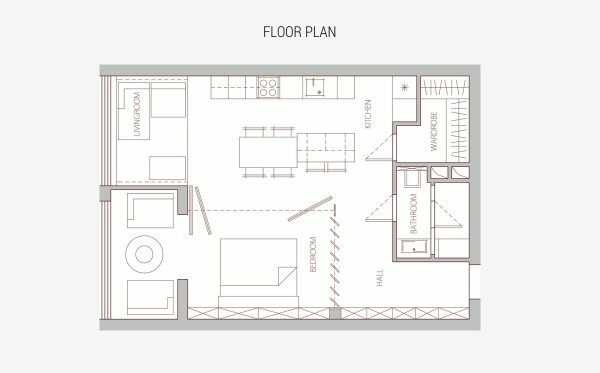 Yes, this kitchen may be small, but the layout makes sure that there is still plenty of space to prepare meals. The kitchen island that doubles as extra eating space is perfect for this compact room. Open cabinetry, large drawers, and more built-in bookcases. 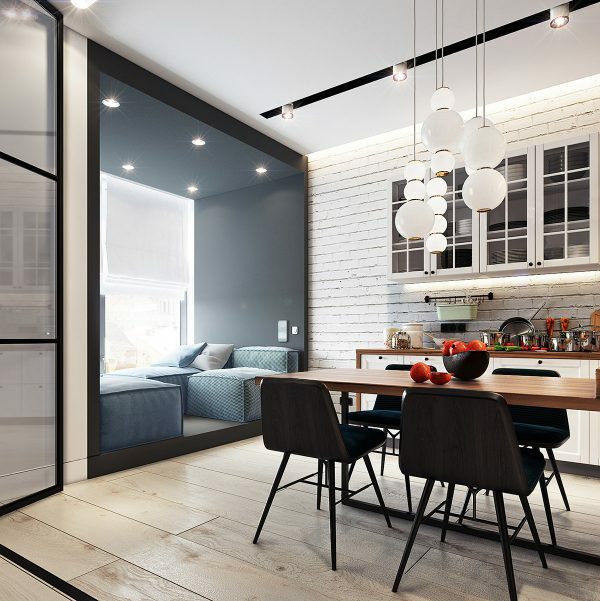 Built-ins are such a great way to maintain a modern, clean feel in a home, all while functionally housing and stylishly showing off your book collection. 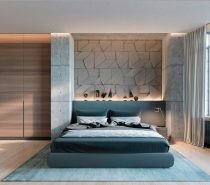 A pull out, accordion wall to give the bedroom a little bit of privacy. 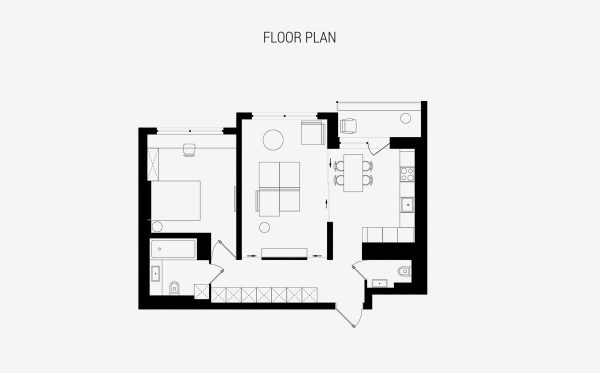 The wall having the same white and wood finish as the cabinetry and countertops helps give an effortless flow between the two rooms. .
From this floor plan we see that there is also a bathroom, walk-in closet, and sitting room. This apartment truly has everything that you could possibly need. 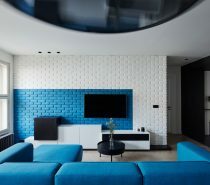 This contemporary, blue living room is a serene oasis with a minimalistic style that we can’t get enough of. 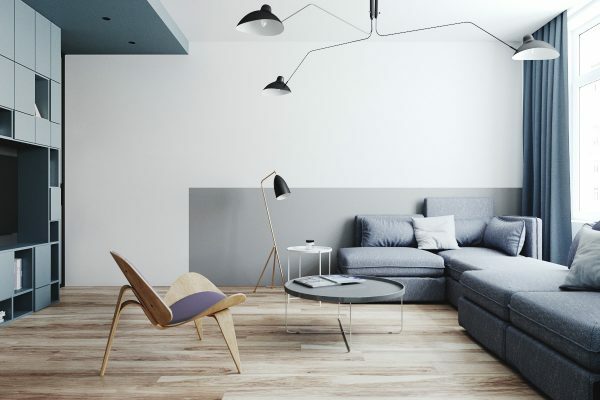 From the Scandinavian modern accent chair, which is the Wegner style shell chair to the unique floor lamp thoughtfully named the Grasshopper, everything comes together beautifully in this space. 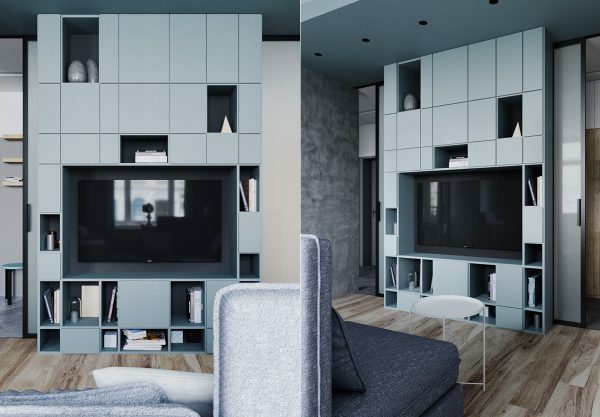 Just as we saw in the previous apartment, built-ins are great to create a high style, storage solution. 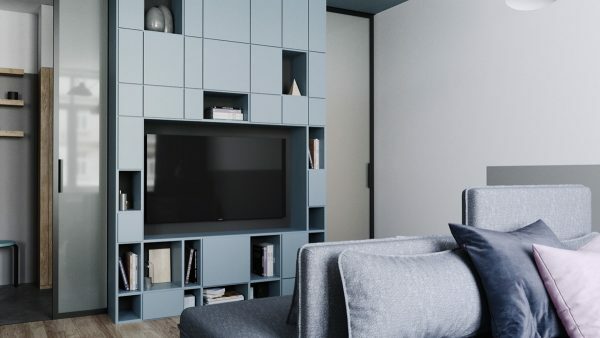 This one is particularly stunning coated in a powder blue finish that helps highlight the rest of the room, all while functionally housing the flatscreen TV. A couple more views of the cabinet and all of it’s asymmetrical allure. The fact that not all the shelves are open gives it a clean, uncluttered feel, which is exactly what a small living room calls for. A sneak peek in to the dining room/kitchen. The combo of white, oak, and stainless steel creates a delicious contrast in both texture and color. The white radiator gives a vintage charm to the room, while the spider-like Serge Mouille style 3 arm lamp adds a bit more of a contemporary vibe. The modern, modular couches are perfect with so many configuration options. Definitely a good choice for a multipurpose home. 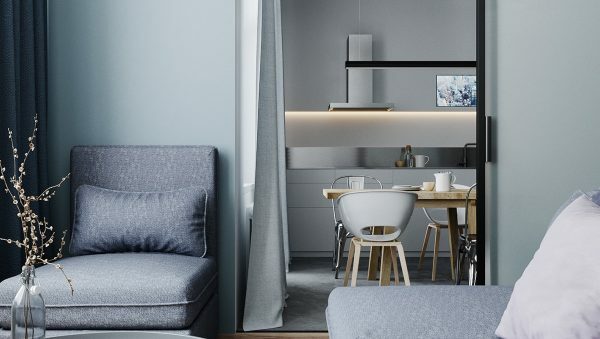 The dining table chair combination in this eat-in kitchen is unexpectedly divine. 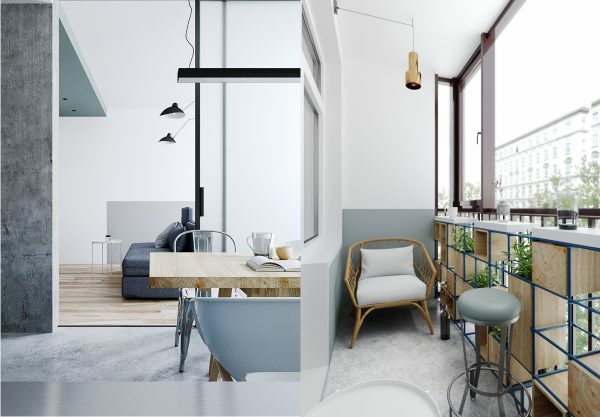 The fact that all four chairs don’t match, adds a quirky touch to the kitchen and helps keep things interesting. And the modern, overhead lighting, is truly the black cherry on top. The oak wood finish and light flooring being carried out on to the balcony really ties it in with the rest of the home’s airy aesthetic. The unique plant display isn’t only great for homing your favorite greens, but it also doubles as a bit of a privacy panel. 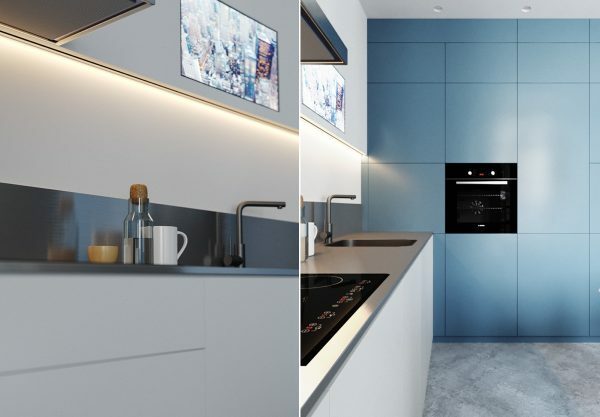 The full wall, flat-panel cabinets in this dreamy blue kitchen are minimalistic, yet make a big impact. 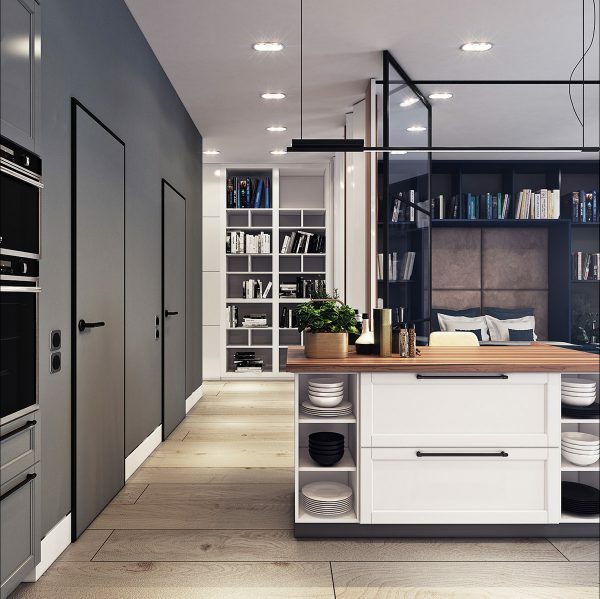 The wall oven and counter stove top only add to this sleek, linear design. 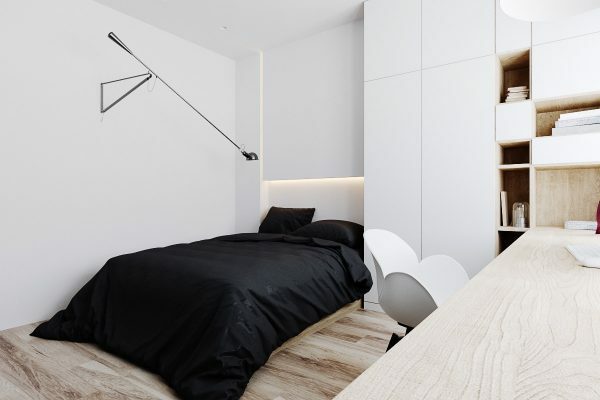 The first thing we noticed in this black and white bedroom is the unique swing arm wall lamp in a Flos Mod 265 style . The original is available here. Black bedding makes a huge impact in this space, contrasting against the white walls, light wood finishes, and white modern swivel chair. 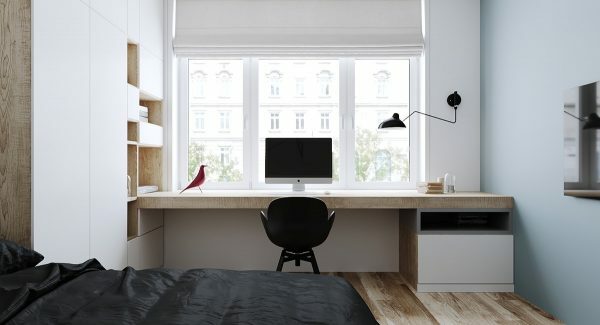 Sure, we would take a 2 second commute from our bed to the office! 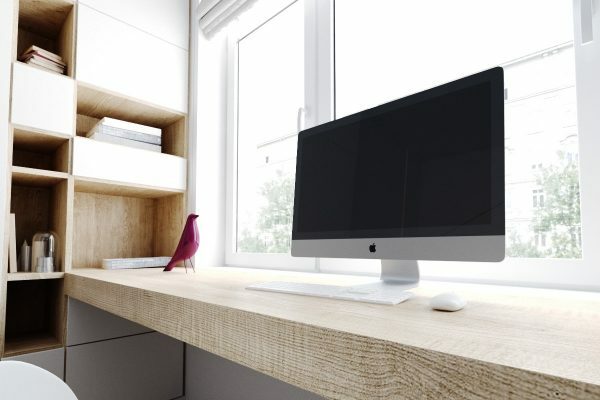 The built-in desk with side shelving and ample desk space, makes a functional and modern home office. The Serge Mouille style wall lamp is also a great fit for this workspace, since it is both flexible and doesn’t take up any desk space. There isn’t much color to this home, besides blue, which makes the Eames bird really pop. He might be the cutest co-worker ever! 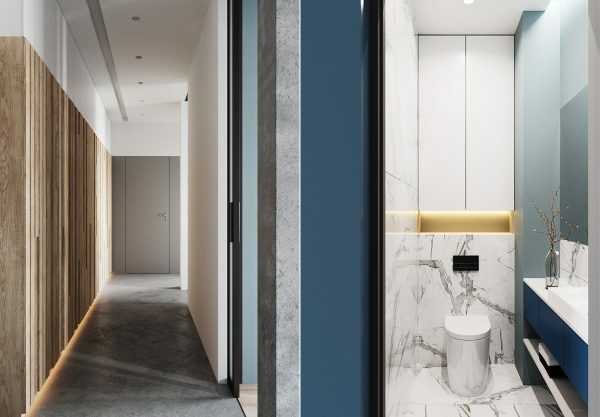 Simple, sleek, and to the point can be used to describe both the hallway and the bathroom in this humble abode. We see that blue has been carried to this side of the house and thoughtfully accented with a gorgeous marble finish. A view from above. 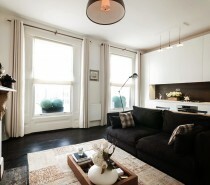 This really gave us a sense of how each room in this small, but mighty apartment, masterfully fit together. 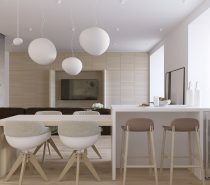 Kudos to visualizers, Vadim Ryzhkov & Evgeniya Raskosova, for creating this stunning home!